Struthiomimus an ornithomimid dinosaur, lived in western North America from 72 MYA to the end of the Cretaceous period 65.5 MYA. Although several excellent skeletons have been found in the earlier Judith River Formation of Alberta, the terminal Cretaceous Hell Creek and Lance Formation have produced only two incomplete specimens. Also works well for a small 'children's dig'. Check out the Struthiomimus Interesting Info page for more info on this specimen. 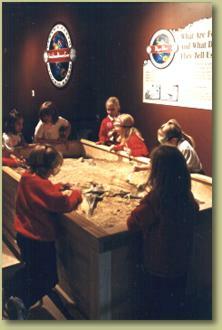 paleontologists to experience the excitement of excavating a dinosaur skeleton.